Good things are happening at present down here trout wise, and as we move into the Southern mayfly bonanza of autumn, I’m looking towards our smaller rain fed waters to keep me entertained with surface feeding fish. There’s something amazing about a small stream mayfly hatch - Snouts poking up towards the surface, leaving tiny, effortless dimples upon the water... this is wee emerger country, and the domain of the spent spinner! Now I could ramble here about locations and the importance of matching the hatch, but why not hit you with something you can use no matter where or when you choose to fish? For April fishing down south, check out last years April / May issue of Troutfisher, which any good angler should have stashed away on the bookshelf, close to hand in times of emergency (or is that emergence?). Lets talk about what trout see in your fly... Now agree or disagree with me here, but Id like to hear your feedback. 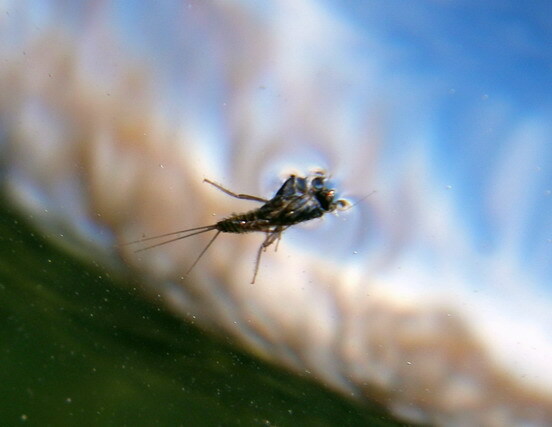 Please note, the following observations are mainly focussed towards surface feeding fish, for I believe that any small dark nymph will do the job if presented correctly, and is of a suitable size. To us, there is a difference between a royal wulff, a humpy and a dads favourite. To the fish, they all appear similar. From below, the trout sees the 'footprint', the impression your fly makes upon the surface, and notes how and where your imitation is sitting in relation to the surface. 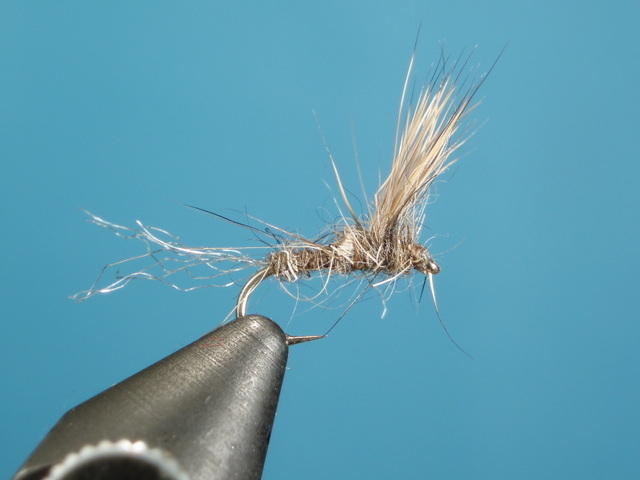 Now, high floating traditionally hackled dries, such as the above named all kick out a similar prey image; A starburst of hackle tips penetrating the surface film near the front of the fly, the tips of the tail also at the rear, the impression of an upright wing and if you are lucky, or have been thoughtful enough to clip the underside of the hackle, a flush floating surface imprint. Prey image is the picture the trout forms in its mind to readily identify an abundant food source, taking less effort than carefully scrutinising every piece of debris that passes in the drift. To do this would be time consuming and take a lot more energy moving to check out all the leaves, sticks, foam etc, so why not key into something readily available and expected? When one particular food source is readily available it does not pay to inspect each and every item in the drift, and trout can then afford to hold just the one search image. This is what we often allude to as selectivity. Primary triggers are quaities we impart in our tying to better fit the percieved prey image of the trout. So what to trout look for? How do they readily identify their meal? Recent discussions over wine with John Dean, Bob Wyatt and Bob Morton have developed ideas in my mind regarding this, but the following I believe holds the most water. Your fly must look roughly like the natural you are imitating. Not necessarily in minute detail, but in general appearance. I believe in generalist patterns fitting several differing prey images over impeachably tied direct imitations. Look at a fly with crossed, or fuzzy eyes and that is the silhouette I am talking about. For example - you look outside and see a moth on your window pane. Without thinking about it you instantly see the triangular shaped body roughly the size of a coin and maybe the two feelers / antennae. This simple image immediatly seperates these moths from other gunk on the glass in your mind. This is your prey image of the moth. For an emerger pattern I want a hazy, non descript, messy silhouette achieved through loosely dubbed hares fur and deer hair. 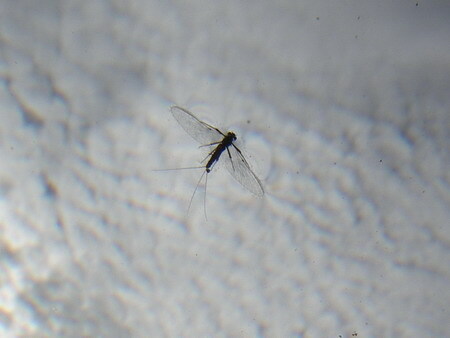 This imitates the emerging mayfly to a T, passing through several changes whilst in the meniscus. Legs are flailing, wings are unfolding, and exoskeletons are being shed - trout are expecting multiple silhouettes here, and same goes for the dun. Sometimes a few legs are stuck in the surface, maybe a wing, the body may or may not be still in the surface and the wings are still drying out / pumping up. Think cicada or beetle also - you want a messy bulk sitting flush in the surface film. Legs flailing, trapped in the grip of the surface tension. A clipped deer hair pattern, leaving plenty of stray hairs or sporting a few turns of a parachute style hackle throws out a convincing silhouette here, far superior to the high floating, full hackled commercial ties in my opinion. Your fly must sit in or on the surface in accordance with the natural, and this is where so many patterns fail. Trout wont take your dads favourite on the Mataura? Its sitting too high! He refuses your stimulator on the Oreti? Its sitting too high! So your full hackled beetle doesn’t work on the Waipahi? Its sitting too high! Lets face it. Mayflies, beetles, terrestrials etc do not like sitting on the river. They are vulnerable to predation and saturation, and if they could, they would fly away immediately. The reason they cannot is they are stuck in the suction of the surface. If they were standing up on straightened legs, body free of the meniscus they would take off right then and there. Now this states the obvious. You will catch more fish if your pattern sits flush in the surface, as opposed to high upon it. Make your pattern vulnerable. Throw away your high hackled traditionally tied dries in favour of parachutes,or clip down the hackles and get that flush floating footprint of the body to the trout, imitative of the natural! And I don’t think I even have to mention the importance of flush floating spent spinner patterns! Lets look at those wee emergers. 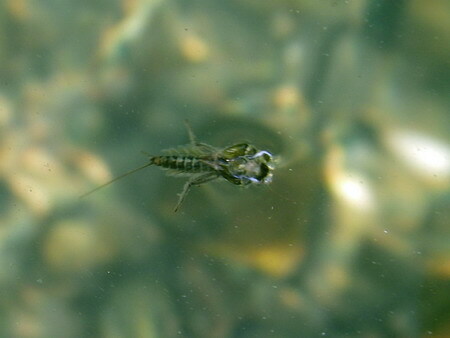 We all know these are the nymphs morphing into adults at the surface, often just beneath, so why present a pattern on top? I believe the two essential triggers for a successful emerger pattern are the sunken abdomen beneath and upright wing above. In short, a damp / dry imitation siting within the surface film and penetrating just below. Get your fly sitting where the naturals are and your success rate will skyrocket! Your fly must behave like the natural, simple. 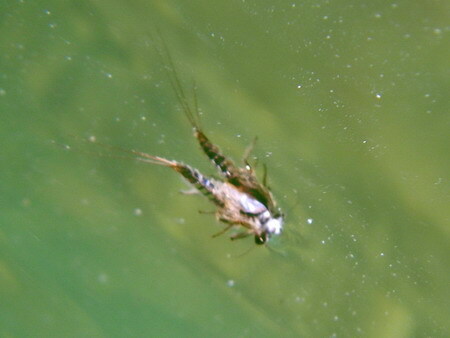 A wee emerger in the surface film isn’t gong to skitter across the surface like a caddis, get my drift (pun intended)? If you are fishing a large terrestrial, say a cicada or beetle, let the trout see the drop, and don’t be afraid to impart a twitch or two to simulate the struggling of these large insects. On the other hand, there is very little movement in say an emerger, or spinner bar the occasional subtle twitch, but with these the trout will often respond to a dead drift. In backwaters or slower river margins, a gentle 'Trayser twitch' may be required to catch the trouts attention from afar, but be careful not to over do it. In situations where currents prevent a drag free drift you would be mad to pitch a wee mayfly. Why not try a small flush floating caddis which is expected to skitter across the current a little? Its just little tricks like this which can turn those difficult situations into successful memories, and you'll feel much better for it. Make your fly act like the natural the trout knows oh so well! I believe that one or more of these qualities must be incorporated into your ties to successfully fool trout on a regular basis. We now know what the trout look for, lets give it to them. The above also are detailed in what I believe is their order of importance, beginning with size, moving onto silhouette, posture then behaviour. I also believe that if your artificial is of the right size, and possesses a suitable silhouette, these two primary triggers alone may be enough for the trout to hit, with posture and behaviour there for the more discerning fish. As you can see, for me, colour doesn’t really come into it, as long as your pattern is of sensible coloration or a natural hue of sorts. Presentation over imitation guys - if you follow the above theory and are refused, then take a closer look at your drift! It really takes the mystery away from those so called selective trout, doesn’t it?